Original photograph | Colorized version (full resolution) (colorized by Mads Madsen). 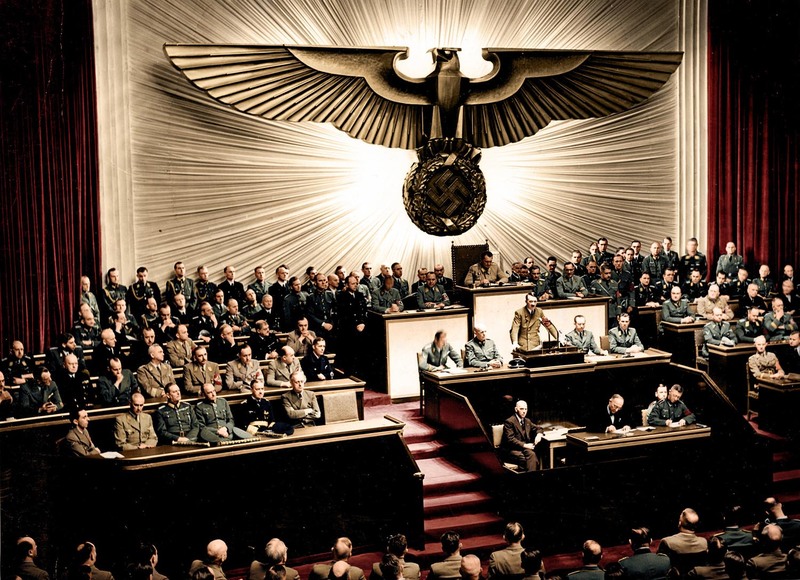 The speech to the Reichstag was originally planned for December 10, but it was delayed for a day so the German and Italian Embassies in Washington had time to burn their cables. Hitler’s declaration of war came as a great relief to British Prime Minister Winston Churchill, who feared the possibility of two parallel disconnected wars (UK and Soviet Union versus Germany in Europe, US versus Japan in the Pacific). With Nazi Germany’s declaration against the United States in force, American assistance for Britain in both theaters of war as a full ally was assured. The reason Herman Göring’s chair is bigger is because he was Reichstagspräsident which means president of the Reichstag. In this position it was his duty to overwatch discussions and such, that’s why he’s sitting above the others. It is similar to how the US House is set up during State of the Union, with the Speaker and Vice-President (who serves as President of the Senate) sitting behind the President, and in normal days whoever is presiding officer would be seated there. It’s a standard for Parliaments and Congresses. The eagle background is quite a feat, its sharp edges and predatory posture impose power, discipline, order and fear. Everything Nazi was basically made to impress and especially to intimidate. Selling an image is easier than selling an ideology, especially in the environment Germany was in during that time. "The USA was neutral in name only at that point and was going to join the war on Britain’s side sooner or later" - a bit misleading considering the US had already been running supplies and escorts for Britain for a long time by that point. Neutral in name only is correct, but they were already actively opposing Germany. If I remember correctly up to the declaration Germany had explicit orders not to fire on US vessels (even though they were escorting or delivering supplies to enemies). "Hitler had received no advance notice from the Japanese about the attack on Pearl Harbor." "The bombing of Pearl Harbor surprised even Germany." Germany was notified of the impending attack on the US on November 30, 1941, a week before the attack. Japan had requested (on December 2nd) a joint declaration of war. Hearing nothing in reply, they asked for the same from Italy. Again hearing nothing, they proceeded with the planned attack on their own. Neither Hitler nor Mussolini were surprised, as they were told in advance. There are still unreleased secret documents from WW1, let alone WW2. Every year, we the public, find out new information regarding actual events of monumental historical events. Personally, it is my view that certain facts and incidents may never be known or made public. Only in the last dozen years, has it be absolutely acknowledged that the U.S. Government knew (in advance) the Japanese were on their way to Pearl Harbor. Essentially, the powers that be decided that some people had to die. That position went on for years, since the government did not want the enemy to know we had broken their secret codes. Bottom line is not to trust any government, whatsoever. Governments always wind-up backstabbing their own citizens. Its what they do. The United States was never on its alone. China and the British Empire were also at war with Japan. Hitler and Mussolini should have declared war on the US in September 1940 after the Destroyers for Bases Agreement. I meant to say the United States was never on its own. Japan did not have the industrial, economic and military capacity to wage war simultaneously against the US, the British Commonwealth and Empire, and China. Hitler had already informed the Japanese he would declare war on the US even if they made the first move, as he needed to begin the Second Happy Time. He was fully aware of Rainbow Five and the Plan Dog memorandum.